In most cases, children, toddlers and infants are actually better “intuitive eaters” than adults. In other words, they respond better to hunger and fullness cues. Unfortunately for adults, our eating habits have been corrupted by our environments. How so? We grew up in the “clean plate club.” Our moms and dads made us finish everything on our plates. 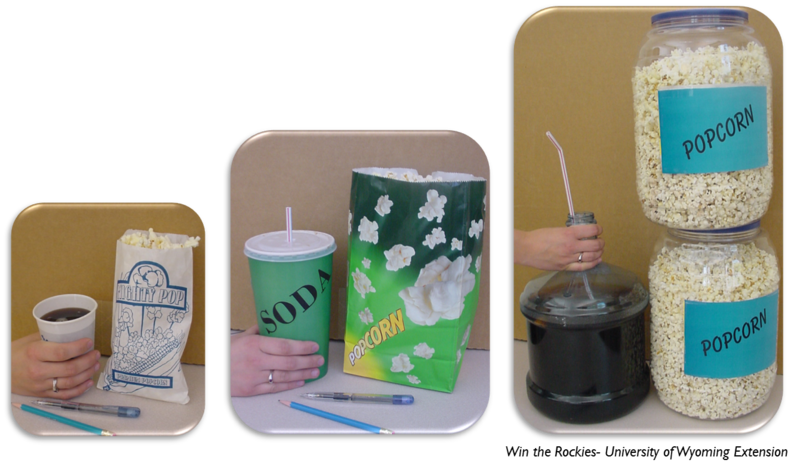 Today, portion sizes keep getting bigger (in 2050 a regular soda at the movies will fill a water cooler jug if current trend continues) and these values, although helpful during times of hardship, might contribute to eating too much. We eat to cope with emotions. When food is plentiful, we eat when we are stressed or bored. Although this behavior is normal in moderation, it is problematic if it happens too much. We eat too quickly. This was a problem in my family growing up- my dad and I would finish before my mom sat down at the table. Today, our environment promotes fast eating. We have only so much time at work for lunch and our children, in some cases, have only ten to fifteen minutes to eat at school. Eating quickly does not allow us to respond to our fullness cues and again we might eat too much. We skip meals all together. Many skip breakfast and lunch and eat only one meal a day. By the time dinner arrives, well let’s just say horses better hide! Sometimes, people can eat more in one meal than eating smaller meals throughout the day. We go on extreme weight loss diets. In a culture of “thinness” the temptation is to go on diets where food is restricted and hunger cues are ignored. For many this promotes obesity because the body may become more efficient at converting food to fat when normal eating patterns return after the diet. We practice “distracted” eating. We eat when we drive; we eat in front of the T.V. and at events. In these situations, we are distracted from our hunger and fullness. Avoid distracted eating by encouraging family meals. According to Thriving Newsletter by University of Missouri Extension, several studies have demonstrated that families that eat together at the table actually are healthier. Avoid extreme weight loss diets. Rather, set behavior goals rather than weight goals. For example try to set a weekly walking goal than a goal to lose 10 pounds in a week. In addition, your children will not model your dieting which could potentially lead to an eating disorder. Eat breakfast. Research clearly shows that those who eat breakfast have better health outcomes. Slow down. Put your utensils down between bites. Pay attention to your hunger and fullness. Pay attention to emotional eating. Find other healthy behaviors such as walking to replace food. Snack on healthy food such as fruits or vegetables.